Alice would be at quite at home in these whacky restaurants! 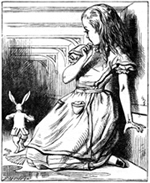 In Lewis Carroll’s famous tale, Alice sipped from the bottle labelled ‘Drink Me’ and grew smaller and smaller. ‘Eat Me’, enticed the cake – one bite and she grew bigger and bigger. But that was fantasy right? Well, maybe, but I tell you, there are some weird and wonderful things happening out there in restaurant land. They’d challenge anything that Alice found down the rabbit hole. In true ‘Wonderland’ style, the owner of the Spirite in Montreal is, by all accounts, more than a little loopy. Don’t bother to ask for a menu – chef cooks only one dish and that’s vegetarian. Portions come in two sizes and with one proviso. You have to eat up; if you don’t clean your plate, you won’t get any pudding. Yes, really! And if you don’t eat all your pudding – then you’re barred for life. Crazy? Perhaps. But people still flock there! Maybe they like the restaurant’s mission – to draw attention to world hunger and food waste. Or happen they’re just masochists. Chew Chew in Sydney adds a whole new meaning to the expression ‘doggy bag’. Here the rule is ‘dogs only’, though cats are allowed in after 2pm. Humans are welcome to eat with their pets but must get their food from the café next door. At Zauo, a fish restaurant in Fukuoka, you’re offered a rod, so you can catch your own meal. The pool’s well stocked so, even if you’re no fisherman, you won’t go hungry. At the Taj Banjara in Hyderabad you can choose your dishes according to your blood group. Great for vampires, although they may prefer to fly to Japan to dine at Nyotaimori. Named after the tradition of eating sushi and sashimi off a naked woman, it’s a vampire’s paradise. The ‘body’ is offered on a hospital trolley, the hostess makes the first cut in the dough skin with in the scalpel, then the patrons join in. There’s plenty of ‘blood’ and the organs are edible. Did you know that there’s a McDonalds, a Subway and a Starbucks at Guantanamo Bay! How’s that for surreal? Admittedly they serve the military personnel on the base but, apparently, if the internees behave themselves they are sometimes treated to a Big Mac. They don’t say if they’re allowed fries! At the Ostfriesland Hotel in Norden, Germany you have to get on the scales before they’ll let you in. The Black Frog in Maine offers a free sandwich if you’re prepared to strip off and skinny dip. There’s a restaurant in Japan where you’re served by real monkeys and a pub in Britain where they confiscate your shoes. Toilet themed restaurants, birth control restaurants, dining in the dark or suspended in the sky – think of something crazy, you’ll find someone’s got there first. And yes, there is an Alice themed venue. More than one, in fact. You’ll find them in Tokyo and Manhattan. The former comes complete with a Glass World and Fantasy Forest. As far as I know, no one’s has disappeared down a rabbit hole. Yet!